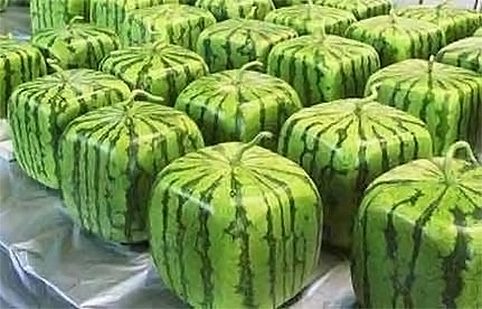 Ever heard of, seen or purchased a square watermelon? The topic came up the other day at lunch while chatting with some co-workers. As we typically do, someone at the table Googled it to share that the Japanese began in 2001, growing watermelons in square containers so they would fit better into a typical Japanese refrigerator. A simple solution to a problem we have all experienced. The conversation got me thinking. Isn’t it interesting how something as familiar as watermelon can become “weird?” The fruit taste the same. The color, texture and pattern on the skin is the same. So what’s the big deal? Why does this one change in shape seem so strange? Why does it take you outside your comfort zone? As Greg and I begin our Asian Adventure with a move to Shanghai, China we’re going to take advantage of all the “weird” experiences. We’re going to celebrate the things that are familiar and seem to be the same with perhaps just a different twist than what we’re used to.